Okay, we won. But what's the prize? As a child, I loved the colourful rhymes of Dr. Seuss. His characters were so fantastical and silly, with names that made you giggle whilst you learnt. Some of my favourite stories were The Sneetches and The Lorax. The Sneetches was a wonderful parable of the celebration of diversity (actually used in Bosnia to teach young children to have racial tolerance) that I understood at a very young age when, at the age of 10, I asked my mother whether the stars on the bellies of the star-bellied Sneetches were supposed to represent being a boy and prayed for McMonkey McBean to show up on my street. The Lorax had and even more obvious agenda. This furry little creature spoke for the trees and spoke of the ways the trees and the water were tied to the health of the general ecosystem of the valley the Once-ler was destroying in his quest for biggering and biggering (a term that I use to this day to describe the zero-sum game most businesses play). He kept popping up to show the Once-ler (the representative of big business) that his benefiting from clear-cutting the Truffula Trees (to make thneeds...that everyone needs) was hurting the environment and the animals that depended on it. Of course, the Once-ler eventually learnt a valuable lesson, but too late. He had no more trees to chop down, customers moved on from the Thneed trend and he was left with an environmental mess, riddled with guilt, looking for someone else to clean up his mistakes. It was obvious to me at a young age that Zeuss wasn't talking about some fictional industry, and, by the time I was 14, I was writing letters to editors and sitting-in in protest with fellow neo-hippies. 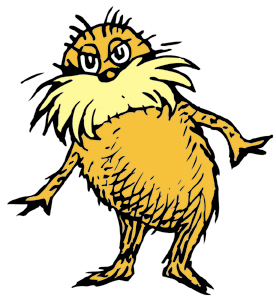 Today, I see many Lorax's around, the most powerful example of which is the Inconvenient Truth work by Al Gore, that warns the world that, even though we may not personally feel it, we are moving towards a world in which there will be no more earth to exploit. The future seems bleak, indeed, but I have noticed some growing memes in the recent year that have led me to believe that things are actually changing...actually shifting towards a more Lorax POV. Each theme overlaps in a significant way and is fueled by Open Source principles and the Web 2.0 world spirit as well. They are: The Triple Bottom Line, The Science of Happiness, The Non-Zero Economy, Boutique, and Community. I keep hearing this phrase popping up everywhere from small business owners to politicians. The triple bottom line means that businesses have two switch from merely thinking about : People, Planet & Profits. As I learnt in the amazing documentary, The Corporation, the law behind corporate entities are set up to only focus on one bottom line: profit...and, according to the documentary, the bottom line looks more like this: profit at any and all costs. If you haven't seen the documentary, I highly recommend it. What was most poignant for me is that the responsibility for the costs of success are shifted to shareholders, who simply cannot be held accountable as they are not part of the decision process and don't understand that maximizing their profits comes at the cost of many things: humans, environment and their own livelihoods. The shift towards the triple bottom line is an important one then. It actually defies the legal specifications of a corporation. Will the law follow suit? Everywhere I turn there is another article or paper or book on the growing science of happiness. I'm really enjoying reading Dan Gilbert's latest, Stumbling on Happiness, but I, personally, got interested in the subject way back in 'the day' (more like my 2nd year of university) when I was introduced to Marilyn Waring's work. Although she didn't explicitly talk about the economics of happiness, she did provide me with an amazing argument for why we should NOT be measuring progress by GDP, the main point being that it leads to 'The Corporation' type practices and misrepresents actual well-being in a country. Certainly, having no money can make you miserable, but studies have shown that having heaps of money makes you no happier than having enough money (and 'enough' is seems to be what brings you out of constant struggle and into a comfortable standard of living, which varies with the cost of living. In SF, for instance, that # is probably $100k, whereas in Calgary, it's probably closer to $50k). In fact, some making heaps of money actually experience more anxiety and those shooting for having heaps of money often sacrifice their personal lives to get there. So, this new outlook on happiness is leading to many folks surmising that we need to start valuing more than just what's in the bank (shock!). The title of this post alludes to this. So, we've won. We are the biggest company in the world. Top of Fortune 500's and on the tip of everyone's tongues and riding high. But what about it? What does it get us other than the continued struggle to stay there, the target of everyone else's desire to de-thrown us and continuous pats on the back? Personally, I can't count a single company that has held the 'top spot' for all of history. And more die trying than actually get there. Sure, there are perks at the top. Money buys loads of influence, but as many are envious and waiting for you to screw up, you can't really exploit that to its potential. And because you are so scared of losing the top dog spot, you start to do really asinine things to keep it. Look at all of the awfully desperate things Microsoft is doing these days. It only makes it more sad because of their glorious position at the top at one point. Another recommendation is Robert Wright's Nonzero: The Logic of Human Destiny, where he surmises that society becomes increasingly non-zero-sum as it becomes more complex, specialized, and interdependent. I agree with him as I look around me and see the mountains turning into the foothills and a growth of co-opetition towards better outcomes for customers. I wrote about the Boutique Era a while back and I continue to see signs of the growth of the sentiment towards 'craft' and the support for the local. Everywhere I travel, people recommend their local coffeeshops, little holes in the wall neighbourhood restaurants and the true boutique hotels (not the 'W', but hotels in restored buildings, decorated by local artists and run by pillars of the community which are quite reasonable). They wrinkle their noses in disgust at Starbucks, P.F.Chang-type chains and Mariotts. Even with the clear benefits of 'points' and consistency, more an more people are choosing the local and the boutique. Part of the reasoning is the desire to create individual experiences, which cannot be reproduced en masse. Another reason is that it's proven to be better for the local economy to buy goods produced locally, which, in the long term, benefits the residents willing to pay a little more today. Local restaurants are more likely to use truly organic food, so health is also a factor. But most of all, there is a growing backlash against the global brands that don't seem to change no matter what community they invade. When we look at companies that do endure over longer periods (and by 'endure', I mean brands that stay around for many decades, but stay pretty steady profitability - no boom and bust, only happy coasting), they tend to focus more on the customers and creating individual connections than appealing to a mass audience. Some of them have even resisted growth in order to stay true to that principle as outlined in Bo Burlingham's Small Giants: Companies That Choose to Be Great Instead of Big. Companies like Kiehl's that have been around since 1851 represent this for me, but majority of these companies, you probably wouldn't have heard of unless you actually live nearby or you've had a good friend rave about them. They don't generally spend money on mass advertising because their strength is in spreading via word of mouth. Any large influx would actually damage their ability to personalize their service. Slow and steady and aligned with their customer community is what will win their race. They don't worry about 'crossing any chasms' or look to the Fortune 500 to measure their worth. Each and every customer that comes in their store or calls them to say, "My good friend so-and-so recommends you highly" is worth more than the actual purchase. These companies have decent positive income, happy employees, ecstatic customers and value connections over consumption. Sure, commoditizing something brings in big bucks today, but focusing on community creates long term, sustainable businesses. Things are shifting and, in an amazing conversation with Marilyn while I was in Wellington, she agreed that the perfect storm is brewing that is leading to a disruption of the current economic outlook. As more and more people hear about alternative measures to the GDP (most notably the GPI, but also the success of the GNH in countries like Bhutan - login required), start thinking about Happiness and alternative measures of well-being and discover the amazing experience of local, the more this shift will happen. I truly believe the democratization of publishing and distributing has gone far towards influencing this shift. As more an more of these 'amateurs' go online, the more and more the powers that be will be unseated (there is a reason why Andrew Keen feels threatened by them) and the more and more people will start to define their own measures of success and you had better believe that there won't be a centralized organization telling us what those are. So, truly. Even if you could win this one Microsoft...what really IS the prize? You're victory party is going to be a little lonely me thinks.